All transactions are safe and secure with a reliable history in online purchasing behind each of our associates. Buy the Cyberdyne t-shirt to own Terminator clothing and merchandise. 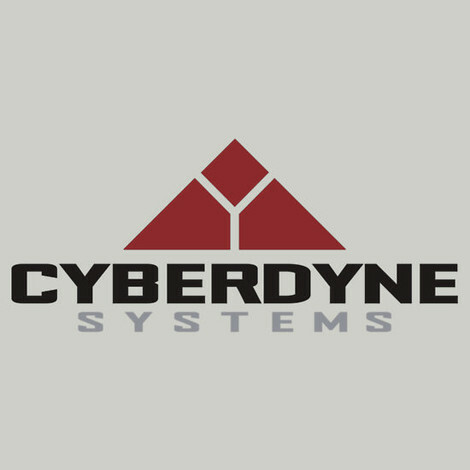 Cyberdyne Systems Corporation is the company that developed Skynet. The logo on this Cyberdyne t-shirt can be seen throughout the movie Terminator 2: Judgment Day when John Connor (Edward Furlong), Sarah Connor (Linda Hamilton), Miles Dyson and the T-800 Terminator infiltrate Cyberdyne headquarters to destroy all the research regarding Skynet. If you like this Terminator tee, be sure to check out the Skynet shirt below. Don't miss the Terminator mask and costumes either. In addition to the Cyberdyne tee above, browse the Terminator Clothing Gallery for more apparel like men's and women's clothes, kids shirts or hoodies.